I’d like to invite you to our Open Studios next weekend. 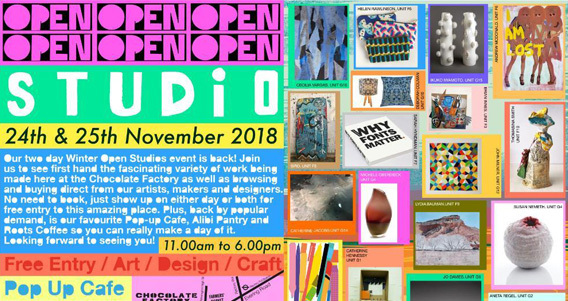 All the artists in our magical converted Victorian Chocolate Factory will open their doors and invite you in to see their work, please join me in the Type Tasting studio. I’ll be showing a new set of typographic drawings based on display types of the 1800s, along with plenty of typographic ephemera, screen prints and I’ll be signing copies of my books. Take part in experiments including chocolate tasting and smell/type pairing. Chat about plans to publish my research, and get a sneaky peak at the new Type Dating Card Game coming out in February. Saturday 24th & Sunday 25th November, 11am to 6pm. Chocolate Factory N16, Farleigh Place (off Farleigh Rd), London N16 7SX. 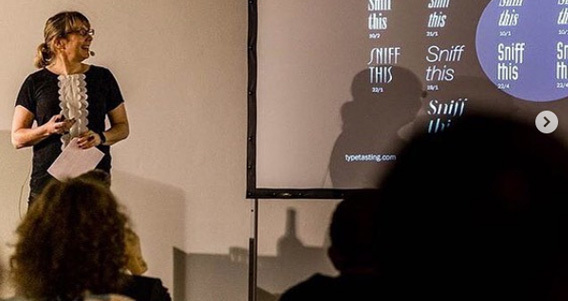 It was a privilege to talk about my research at the Beyond Type event in Hamburg last week, here I’m presenting the type and mood/memory mapping results from the Font Sniffing experiment. You can play a part in getting all of this research published next year by signing up to my new Patreon page. I’ve been researching the perception of typography for the last five years and I’m excited that I now have enough results to start publishing them. How do fonts impact mood, alter what you taste, and what does your choice reveal about your personality? My plan is to write, design and publish a series of small books that will document the process, and share the results of each topic I’ve investigated. The books will be written in everyday language and designed to be attractive, accessible, a little tongue-in-cheek (like the experiments) and filled with examples to show why the results are useful. It’s going to take time and money to do this, and this is where I need your help. Sign up to my Patreon page here. Copyright © 2018 Type Tasting, All rights reserved.